Maxene Magalona and Rob Mananquil exchanged vows in a beach wedding ceremony on Thursday afternoon, January 11, at Shangri-La's Boracay Resort & Spa in Boracay, Aklan. Maxene Magalona and Robby Mananquil's beach wedding is currently happening at Shangri-La's Boracay Resort & Spa. All eyes were on the 31-year-old Kapamilya actress, who made her grand entrance wearing the Odelle bridal dress from Vera Wang's Iconic Wedding Dress Collection. The bride went for the ivory strapless soft mermaid gown made of silk crepe, with cut-out and cowl back details, and a fishtail skirt. According to Vera Wang's website, the price (in U.S. dollars) of their bridal gowns starts at $2,900 or around PHP150,000. Maxene's bridal make-up was done by Denise Ochoa while her hair was styled by Ethan David. The radiant bride walked down the white carpet where she was met in the middle by her mom Pia Magalona. And while her late father, rap icon Francis Magalona couldn't be with them, his song "Girl Be Mine" played in the background. Tim Yap uploaded Maxene's wedding march on his Instagram account and wrote, "And @maxenemagalona walks down the aisle to be Mrs to @robmananquil #irobyouverymaxx"
Before her wedding march, Maxene had her photos taken with her bridesmaids which included Julia Montes, Janna Tee, Lauren Young, and Megan Young. 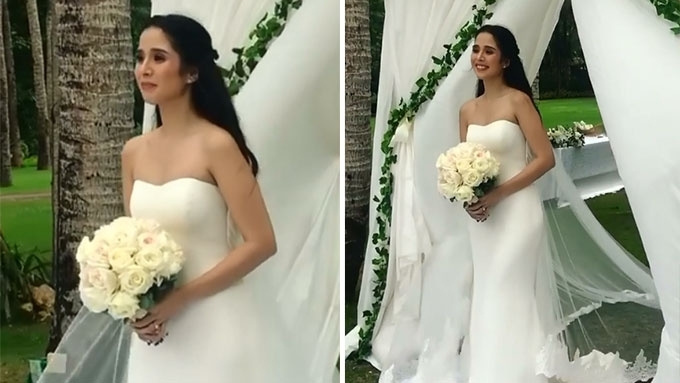 Maxx (Maxene's nickname) first revealed that she's a #VeraWangBride in an Instagram post last Sunday, January 7. Meanwhile, floral & event designer Teddy Manuel prepared her bouquet made with white lilies and roses and adorned it with a locket in memory of Maxx's dad Francis. Teddy posted a photo on his Instagram account and wrote, "Simple yet meaningful bridal bouquet today for @maxenemagalona. A touch of a locket makes a touching sentiment to share and remember her father on her wedding day ... #irobyouverymaxx #magalonamananquil."